Give your students the edge by teaching them about hydrogen production with this exciting and safe demonstration unit. The AutoARK® Ed comes complete with its own set of workbooks, efficiency calculator, and video. One CD contains all you need to provide curriculum and training for all students and staff. The student workbook includes review sections complete with questions. The curriculum address several criteria covering multiple departments; Agriculture, Science, Math, Physics, and Green Technology. Educate our students on the future of clean fuels and renewable energy. Demonstrate the many uses for hydrogen. Store hydrogen & turn it back into electricity w/ a fuel cell. Light a torch & show the clean carbon free flame burn. Convert an internal combustion engine for a clean odorless emission. Inflate a balloon and watch it rise. Calculate efficiencies of hydrogen production. Demonstrate making H2 w/ renewable energy. Lead engineers from General Motors have not only endorsed the AutoARK® Ed, but have included valuable curriculum backed by extensive automotive and fuel cell research. An 18 cell AutoARK® encased in Lexan with no assembly required. Adapter valves with flashback arrester for additional storage, ¼ inch high pressure tubing, surge protector with 15 amp breaker, multimeter, combination lock, power cord, Student and Teacher Workbooks, Advanced Teachers Manual, One license per school district or university for unlimited reprints, free upgrades of study materials via the internet, and free access to the Future of Energy Center with a guided tour for class field trips. 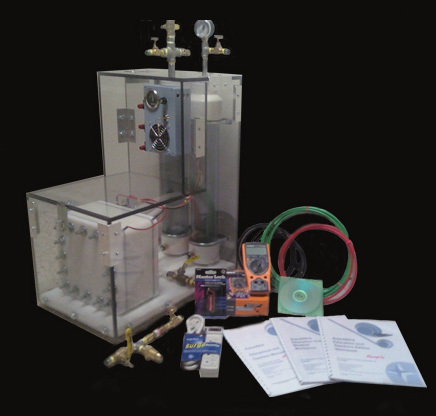 A 60 psi pressure relief valve on the oxygen tower to prevent over pressurization, A snap disk power disconnect to protect against overheating, A lock to control access to inside the lexan encasement protection shield, Schedule 80 clear PVC to provide protection at triple the recommended standard operating pressure. A key to restrict unauthorized access.